Surendra (name changed), a sanitation worker at a government hospital in Delhi, claims he bandages patients, plasters casts and works at labs, besides cleaning toilets and corridors of the hospital. “It is not part of my duty, but a cleaner’s work is not hectic. And there is a major shortage of paramedic staff, particularly at nights, so we help the doctors and laboratory staff,” he says. A doctor from the government hospital admits the staff crunch. This is not a solitary case. Untrained workers are doing paramedics’ work in most government and private hospitals in the country, say doctors and health activists. 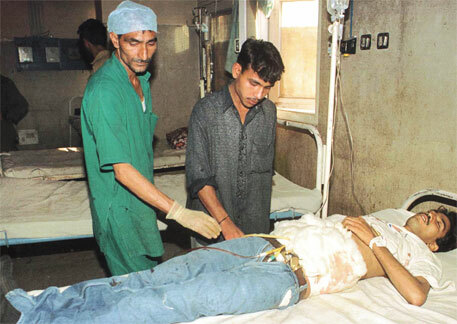 “There is no official data, but approximately 70 per cent paramedics in the country are not trained for the jobs they do,” says Kaptan Singh Sehrawat, general secretary of the Joint Forum of Medical Technologists of India (JFMTI), an umbrella body of paramedics in the country. A recent World Health Organization report, titled A Universal Truth: No Health Without a Workforce, says India is one of the 83 countries which do not meet the minimum requirement of having a healthcare workforce of 22.8 per 10,000 people. The country has 15.8 skilled health professionals per 10,000 people, making it worse than Sri Lanka (24.5), Thailand (17.4) and South Africa (43.4). Cuba is ranked first in the report with 159.1 heathcare workers per 10,000 people. The shortage is so acute that India has more physicians than nurses. Against the globally accepted standard of 2.8 nurses per physician, India has only 0.1 nurse per physician, or one nurse per 10 physicians, says the report. A survey by health ministry’s National Initiative for Allied Health Sciences and the Public Health Foundation of India in December 2012 also highlighted the acute shortage of qualified paramedic staff in the country. 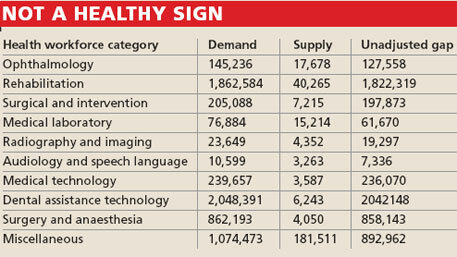 It said India is short by 850,000 anaesthetists and technicians for operation theatres. The story of radiographers and other medical staff is the same (see ‘Not a healthy sign’). Health activists and doctors blame the lack of a comprehensive Central legislation to monitor paramedics for the present situation. They say in the absence of a Central law, there are no standard minimum qualifications for the appointment of paramedics such as nurses, laboratory assistants, compounders, X-ray assistants, etc. To make matters worse, only five states have set up paramedic councils for drafting standards for education in the sector. While the council in Andhra Pradesh has decided on the rules and is implementing some standards, states like Rajasthan, which got their council only this year, are yet to frame rules. In such a scenario, it is left to health centres and laboratories to appoint paramedics and decide their qualifications. For example, the All India Institute of Medical Sciences (AIIMS), Delhi has its own rules. “We frame our rules because we are an autonomous body,” says A K Mukhopadhyay, professor and head, department of laboratory medicine, AIIMS. JFMTI wrote to the Union Health Ministry on November 12, 2013, demanding the constitution of Allied Health Professionals Council of India. The government has finally agreed to set up an Allied Professionals’ Board last week. “It will be a body of the Union health ministry to look after educational standards of the paramedics,” says Vishwas Mehta, joint secretary, Ministry of Health and Family Welfare. JFMTI has welcomed the decision, but says the board will still not solve the problem of recruitment of unskilled people. They are also unhappy with the fact that the rules framed by the body will not be mandatory. It needs to be seen whether such initiatives would help. The Healthcare Sector Skill Council, a non-profit set up by the Confederation of Indian Industry and the finance ministry, released occupational standards for the paramedics for 27 professions on August 15 this year. Paramedics, however, did not welcome the move and see this as a major dilution of their demand of proper regulation with greater involvement of the government. “The standards seem to have been copied from other countries without tailoring them to the healthcare needs in India. The government is also not keen on a law to regulate and standardise skill development programmes. Without a legal mechanism the standards will not be followed,” says Sehrawat. In the past few years, efforts have been made to regularise paramedical education in the country through the setting up of one National Institute of Allied Health Services and nine Rural Institute of Allied Health Services and state-level councils. But health experts say having a pool of qualified paramedics might not result in private hospitals and labs recruiting them. In the absence of a standard minimum qualifications for hiring paramedic staff “a student graduating from an institute without any infrastructure is treated on a par with the one from a well-established medical college”, says B R Meena, director, public health, department of medical, health and family welfare, Rajasthan. Meanwhile, ill-equipped private institutes mushrooming across the country enrol students on false promises of government jobs. Mohali-based private paramedical institute Para Medical Council recently received flak from the Punjab government for advertising itself as a government-recognised institute, which assured government jobs. The institute, which also gave affiliations to smaller medical institutes in the state, was actually affiliated to an open university in Colombo, Sri Lanka. Meena says the state paramedical council will check such malpractices. He says state councils like “the Rajasthan paramedical council will register only those private and public institutes whose syllabus and infrastructure conform to a basic minimum criteria”. The move, he says, will improve the quality of education in the sector. Sehrawat, however, believes that the steps to strengthen the education system will not help “unless there are rules to govern recruitment”. “What will the degree holders do if there are no takers? Those who are unskilled or less skilled are ready to work at a much lower wage, while the skilled demand more money. Recruiters, especially private bodies, do not care about skills,” he adds. Mukhopadhyay says, “Some paramedic jobs like plastering and taking X-rays are better learnt on the job under supervision. Due to technological advancements, laboratory assistants can now perform their duties without much training once a competent authority has calibrated the machine. But when it’s about more technical matters like ophthalmology, prior training is a must.” He says opening national and regional institutes is a good start. Union health ministry officials say it is not planning to make a standardised minimum qualifications for paramedics recruitment. A ministry official, who did not wish to be named, maintains recruitment qualifications will still be decided by states or individual health facilities. Increase the pay n work standards people will definitely work! plus doctors and higher authorities should not act as dominants! these are few of the factors that keep some of the skilled people of medical institutions!